No doubt today is kinda heavy for a lot of us with an oppressive all day news cycle that will stretch into the late hours of tonight with political conversations and then polling results. And let’s not even discuss your Facebook feed. Make sure that you go get your “I Voted” sticker and then take a few minutes to just stare at this photo (click it to see full screen) and then take a few deep breathes. Let it take you away to some place wild. Hear the water tumbling over the rocks. See a brook trout rise to a bushy dry fly in the current seam. Feel the bend of the fly rod and the wet splashes as another brookie slides from your hand back into the creek. You needed that, right? I sure did. 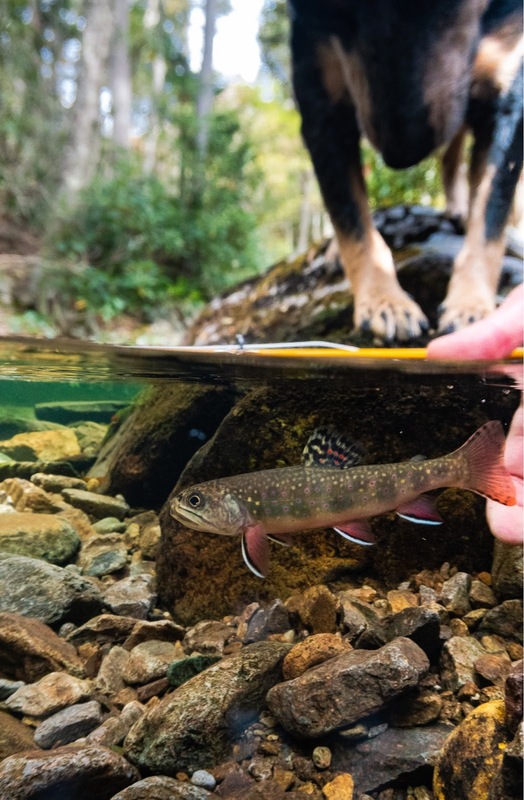 This photo was snapped a few weeks back by Dave Fason as he’s been tagging along with famed fly rod builder Chris Barclay and his pup, Stella. These three have been hanging out a lot lately in the public lands mountains and woods of North Carolina and Virginia where native brookies thrive carrying with them light line glass rods and of course way too much camera gear. How did Dave make this photo? He’s working on a tutorial to his DIY dome rig that he’ll share soon on T.F.M. Until then, follow along with his imagery on Flickr and of course, Instagram. Do you need a custom fly rod that is perfect for these kind of waters? Look no further than the C. Barclay Fly Rod Co. website and keep up with the latest shop news on Facebook and Instagram.